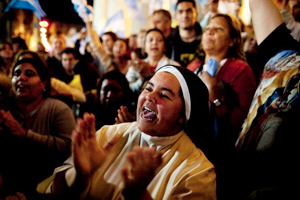 How could Latin America simultaneously become less heavily Catholic and home to an increasing share of all Catholics in the world? It’s because the region’s overall population grew faster than both the global population and the global Catholic population. Between 1910 and 2010, the population of the world nearly quadrupled, from 1.8 billion to 6.9 billion. The number of Catholics also nearly quadrupled, from 291 million to 1.1 billion, keeping pace with the rate of change. By contrast, the population of Latin America grew more than sevenfold, from 78 million to 590 million. During that same period, the Catholic population in Latin America grew about sixfold, from 71 million to 425 million. So, although the Catholic population in Latin America did not grow quite as fast as the region’s overall population during the past century, the growth in the number of Catholics in the region significantly outpaced the average growth among Catholics in the rest of the world.